Charm Inn is situated in a calm and quite residential area in Anuradhapura, the ruined ancient capita city of sri lanka. The charm inn is in a beautiful homely environment with a beautiful tank in the vicinity. It is walking distance from the new town railway station and the new bus station in Anuradhapura. There are taxis and available at call and shopping complexes (supper market) are near by. 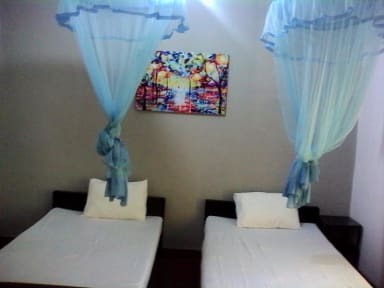 The rooms are equipped with comfortable beds, fans and attached toilets. There is a spacious parlor where guests can relax watching television, reading or playing indoor games. The veranda is spacious with relaxing chairs where guests can enjoy the soft evening breeze. The garden is full of greenery with a summer house. The charges moderate in comparison with those of other competitive rest and restaurants. Services are excellent with deliciously prepared western and eastern dishes which are not very spicy.